For years, the Easter candy of choice in the UK has been the chocolate egg. Increasingly however, the Brits are catching up with the US and are taking jelly beans to their hearts. Six years ago, if all the Easter Jelly Belly jelly beans were placed end to end from Land's End, they would only have reached as far as the Scottish Borders. This year the 80,000,000 Easter Jelly Belly jelly beans consumed will reach a little way beyond the Cairngorms. Not that far from John O'Groats. This growing passion for Jelly Belly® jelly beans is not surprising. They are in a league of their own - the coolest, most delicious jelly beans imaginable. 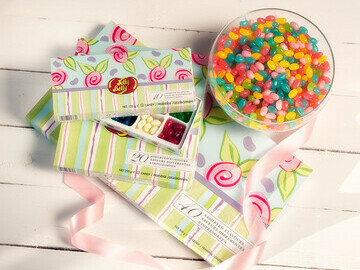 Full of true-to-life flavour, Jelly Belly beans are The Original Gourmet Jelly Bean®. Developed for the sophisticated palate, the beans are packed with an intensely juicy taste, from their brightly coloured shells right through to their centres. Blissful indulgence. Using a time honoured method and the unique Jelly Belly know how, a single jelly bean can take up to 21 days to create. The 90 authentic flavours use natural ingredients wherever possible and can be combined to create an almost infinite number of taste experiences. Traditional flavours like Green Apple and Very Cherry have endured for 35 years - ever since Jelly Belly was first cooked up - but this year the big favourites are as likely to be Green Tea and Chilli Mango as Piňa Colada and Juicy Pear. Each Jelly Belly jelly bean contains just 4 calories and is free from fat, wheat, nuts, gluten, dairy and gelatine. They are certified OU Kosher and are suitable for vegetarians . Jelly Belly jelly beans are available in Waitrose, M&S, Sainsbury, Tesco, all major department stores and the best independent sweet shops, garden centres and delis. Telephone 0800 018 4416 for your nearest stockist. * For more information regarding media usage, ownership and rights please contact the the organisation directly.